Ghosts are often said to haunt places where great suffering and loss of life has occurred. Thus it is no wonder that Jeju is rumored to be haunted. The April 3, 1948 uprising on Jeju, often called the Four Three Incident, and its subsequent brutal suppression by the South Korean government is still a sensitive issue amongst Koreans – especially those on Jeju. This short story, although done in a light folktale style, explores some of the darkness of the turbulent era of the 1930s and 40s. 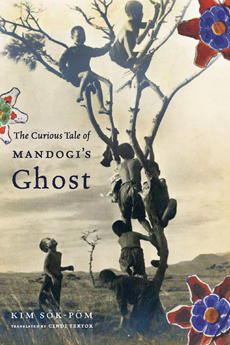 The protagonist is Mandogi, a young priest, who as a boy was abandoned by his mother at a temple on Jeju Island in the late 1920s or early 1930s. It is through Mandogi’s innocent eyes that we witness society’s horrors and the sacrifices that desperate people are forced to make. We follow Mandogi’s life from the morning he is abandoned at the temple, to his days spent working in the mines of Japan, to his return to Jeju and role as an reluctant participant of the Four Three Incident, a role which causes his execution and subsequent return as a ghost. As Textor notes, despite Kim’s claim that Jeju is his “ancestral homeland,” he is “perhaps ideologically aligned more closely with the North.” This becomes quite apparent upon reading this book. Although he portrays the islanders as hapless victims of the political struggle between communism and democracy, he also highlights their selfishness and willingness to sacrifice others. When a policeman takes an interest in a young married woman whose husband is away, the father-in-law willingly sacrifices her virtue for the good of the family. The girl, unwilling to dishonor her husband, hangs herself from the family’s persimmon tree. Instead of earning respect, her ghost is scorned for endangering the entire village and not proving her filial piety. To these simple police, a mere display of the color red casts suspicion on one’s political views. Even hanging cayenne peppers from the roofs so that they could ripen in the sun to a bright red is taboo. Even the sanctity of the temple is not spared from the author’s cynicisms. Mandogi’s illegitimate birth is the result of a brief encounter in a Korean temple in Osaka, and one Jeju priest abandons the Jeju temple to visit his many mistresses. However, it is the temple manager, Mother Seoul, whom the author develops into a symbol of the decadence of the South Korean capital. Described as a “hysterical old widow,” she had operated an inn in a red light district of Seoul before coming to Jeju Island, where she is regarded with some respect, if not fear. Her relationship with Mandogi is complicated. Despite the sadistic beatings she administers to him on a regular basis, he regards her, perhaps somewhat pathetically, as a surrogate mother. At times she shows a rough compassion but is not above using him, even sexually, or sacrificing him for her own well-being. Sacrifice seems to be the theme of this book, and on more than one occasion I felt as if I were sacrificing my time in reading it. It is not an easy read. It won’t do for purely selfish entertainment, but that being said, it is a book that I would recommend to anyone with an interest in Korean history or society during the years just before the Korean War. I especially enjoyed the ending, but I won’t elaborate because I don’t want to spoil it for you, the readers.